Local digital artist @darrennisbett has opened a new exhibition in Eton to mark the 25th anniversary of the Chernobyl disaster. Boutique photo gallery Rhubarb & Custard is showing a series of his striking pictures captured with innovative techinques which offer a chance 'to discover a whole new light'. Infrared lenses, opaque filters and monochrome processing were all used by the artist to develop an analogue feel 'characterised by bright halo's and deep grain noise'. The overall effect creates "other-worldly landscapes where foliage glows, colours are muted and skies look black, set against abandoned and neglected places" which deliberately transform into a 'dreamlike' image when seen by the human eye. Darren said, "I wanted to capture the sense of forlornness, silence and the overpowering grey of the concrete and asphalt and the contrast with the plants and trees... as pools of toxic moss reclaim the landscape from crumbling monoliths." Places that are off the beaten track and are associated with darker moments in history (Chernobyl exists to this day behind armed checkpoints) hold a deep fascination for him because the decay and abandonment build a 'surreal' atmosphere, as he explained, "I was interested in the objects and interiors of the buildings, and the lives of the people who were left behind." During his second journey into the exclusion zone his project took on a new poignancy as it coincided with the earthquake in Japan which crippled the Fukushima Daiichi nuclear plant and provided a 'thought-provoking' reminder of Berkshire's own nuclear legacy, made all the more relevant by forthcoming decisions on the renewal on UK nuclear power generators. One moment stands out in his memory - when he was offered the bizarre but highly appropriate piece of advice at the abandoned Pripyat railway station: "Dont lick the radioactive trains!" The subject matter of the project had a profound impact on the artist's work which "has seen him rebel, in a very personal and constructive way, against the modern photography trends of sharpness and composition" promoted by more mainstream and commercial photography. "It's humbling," he said, "I hope that showing my pictures and contributing to the charity in some way will help the people who are still affected by what happened." 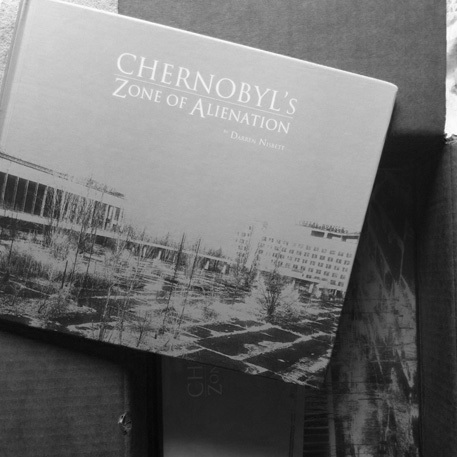 All proceeds from the sale of printworks will go to Chernobyl Children's Project, a charity which works with children affected by health issues resulting from the disaster. 'Chernobyl's Zone of Alienation' by Darren Nisbett is open 11am - 4.30pm, Monday-Saturday until July 31st at Rhubarb & Custard Gallery, 4 High Street, Eton, Berkshire (details). Entry is free. Update: Matilda Battersby in The Independent describes the photographs as 'breathtaking'.